When I first got pregnant with our oldest child I started praying that our babies would know how loved they are. Loved by my husband and I, but also by their Heavenly Father. I also prayed that they would learn to love God and His Word, and to love those in the world around them. And it was with that prayer I started doing Baby Devotions. Some lessons are taught and some lessons are caught. Children learn how God loves them by how we love them. They learn prayer is important and how to love others by watching us do those things. Those are lessons caught and so important, I daresay the most important. However there are also lessons taught. Where we actually sit down and teach our child how to pray, read a Bible story to them, or sing a song about God’s love. Often times it’s so easy just to leave the teaching to Sunday School, and hope something sticks. But I figure if reading my Bible outside of Church is what I need to grow throughout the week, why wouldn’t it be the same for them. So we started dusting off the Baby Bible and reading it everyday. Then that evolved into creating some hands-on activities (ahem…sanity savers) that tied into our lesson. We choose to read the story during breakfast, because waffles always help keep my kiddo calm enough to actually listen. We’re a bilingual family and trying to raise bilingual babies, so we use Pequeña Biblia para Bebes, but really any baby bible should work. Babies love sensory activities, or activities that let them experience and explore new things using their senses (i.e. playing with plastic animals in water for Noah’s Ark or playing with slimy blue Jello when Moses parted the red sea). So I attempt to find something each week that will engage at least one of their senses and let them experience the story. This can be anything from color-sorting to counting to talking about opposites. Basically we introduce a concept that they will use later on in school. I know. I know. Some of the stuff sounds crazy, like trying to teach an 18 month old her colors. But it’s surprising what some kids pick up. And even if they don’t it still builds vocabulary. My baby girl loves crafts, so we will probably find ourselves coloring, painting, or gluing macaroni to something at some point in the day anyway, so might as well make it tie into our story. Ok, to be honest, this one doesn’t always happen every week. I mean it’s pretty easy to grab some goldfish for Jonah and the Whale or talk about how God made grapes during Creation Week. But let’s be real, I have no idea how to tie a toddler-friendly snack into David and Goliath. If you do, let me know! We are not a TV free family. I know the rule, no TV until 2. I also know I have 2 under 2, and in that craziness the toddler sometimes refuses to nap, or the flu hits, or some other calamity and the only thing that will calm her down is Dora the Explorer. Also, I’ve been surprised at how much my kiddo has actually picked up from the TV (Ironically, I think 90% of the English words she knows are from Dora the Explorer). That being said, we incorporate media in our week wether that be the Veggie Tale’s version of our story for the week or a fun song I found on You Tube. Again, we are a bilingual family, so I usually try to make our media in Spanish, but at least 75% of the resources we use have an English version too. 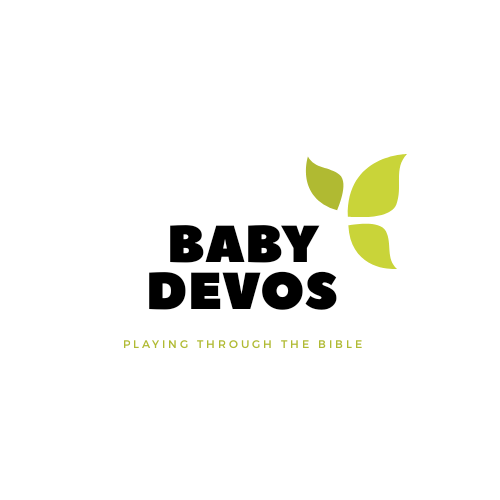 After friend upon friend encouraged me to start sharing our Baby Devotions on the World Wide Web, I’m finally here. We’re all on this crazy parenting journey together, and I figure if what we’re doing in our home can help someone else, then why not share. And I’d love if you shared too. If you find something here that you loved let me know. Or if you were able to adapt one of the activities to work better for your family let me know that too! Comment below.